Power/Abilities: Without armor the members of the Iron Trinity were capable scientists. The armors gave them the ability of flight and enhanced their durability. The armors were also armed with various weapons including ice and heat blasters. The armors could also emit a painful charge of electricity. History: (Marvel Super-Heroes III#2/7 (fb) ) - The three men, who would become the Iron Trinity, worked for Stane International on the Iron Monger suit as scientists and "test pilots". The job gave them access to Tony Stark's notes and although they didn't understand everything they were able secretly able to make powerful armors for themselves. After Obadiah Stane's death they could run their labs freely for a few weeks. They trained with their armors, perfected them and worked out a plan to steal Stane's Sonic Bomb. (Marvel Super-Heroes III#2/7) - The Iron Trinity finally stole the Sonic Bomb and bragged about using it for blackmail. They escaped through the sewers and resurfaced in Harlem in front of the Falcon, who immediately went after them. They used their different weapons on him, but Falcon was still able to grab the Sonic Bomb and fell through a roof when the fired at him. They threatened to kill the people in the house if Falcon didn't return the Sonic Bomb to them. Falcon gave in and returned the bomb to them, but Heavy Metal Jacket still wanted to kill him. The Harlem boy Jeff jumped down to help the Falcon and was hit instead of the Falcon. Angered by this move the Falcon attacked the Iron Trinity, stole the bomb again and flew to the harbour when he saw the timer got activated. He jumped into the water, followed by the Iron Trinity. Killdozer lost his helmet in a struggle with the Falcon and had to return with the hero to the surface while the other two members went after the bomb. When they saw that it was going to blow up in fifteen seconds they got as far away from the bomb as possible. 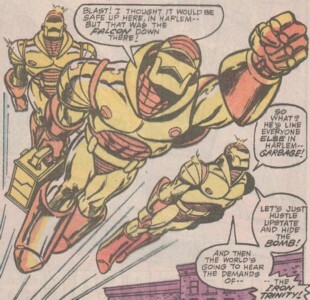 The bomb exploded and some of the more delicate circuitry in the Iron Trinity's armors got compromised. Steel-Fist stopped Heavy Metal Jacket from killing Falcon because they needed their remaining power to escape. Steel-Fist swore revenge on the Falcon and Harlem and then the Iron Trinity flew away. Comments: Created by Danny Fingeroth & Javier Saltares. This story took place some time after Iron Man I#200. On the picture above all three members were seen without their armors on, but none were named in that shot. In the story only one guy was seen without helmet (Killdozer). He was probably the second guy from above on the second image. Thad was a big fan of the Falcon, but his brother Jeff thought that the Falcon was just a show-off. They argued about it while watching the show the Falcon did at the carnival to raise money for the drug-rehab center. 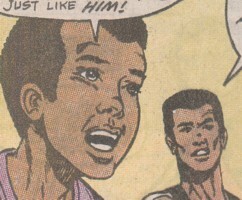 Falcon knew them and their arguments and them a free hot dog. When the Falcon went after the Iron Trinity they followed him and they still argued when the Falcon didn't want to give back the bomb to the Iron Trinity. When he finally did, Jeff jumped down to save Falcon from the Iron Trinity. Jeff got hit by a blast from Heavy Metal Jacket and died. Thad was sad and when he saw the Falcon again he told him that Jeff only died because Falcon had to play hero.